I've been a fan of Lacoste since my High School days. It started with the classic polo shirts until I discovered their line of colorful PVC bags. As much as I wanted to acquire a piece from their collections, the little hefty price never fails to deprive me. It took me years of working before I finally owned my first Lacoste bag. It happened two years ago and the bag is still in great condition. Known today as L.12.12 Concept Shopping Bag, this used to be called as the Lacoste Shopping Bag. This design was well accepted. Hence, new colors and sizes were added over the last years. I love my shopping bag so much. I love the simplicity and space that can accommodate all of my things. Unfortunately, this bag has been overused. This explains the damages you can see on the straps. Years after, I prevented myself from acquiring another Lacoste. It was getting expensive in the Philippines. This happens despite the fact that prices in their official online shop remain the same. My promise of preventing myself to acquire another Lacoste was broken when I discovered sellers who offer the same bag half of its original price. It started with the online coupon deals. I also found local resellers in Instagram and Facebook. These resellers even sell it at prices way lower than the coupon deals. Like a typical customer, I doubted the authenticity of these cheaper versions. I vowed to never purchase from any of them I disobeyed my own conviction when I purchased the new L.12.12 Concept Shopping Bag in navy blue from a reseller very active on Instagram. 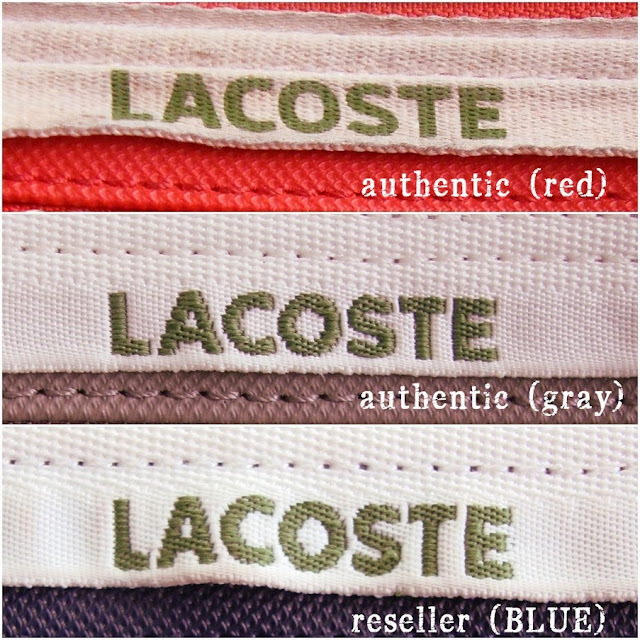 I trusted and became confident with the reseller because I have friends who previously purchased Lacoste items. The reseller also joined reputable bazaars and trade fairs. I should have been happy and satisfied with my very discounted purchase. Part of me however still feels restless and doubtful. I want to convince myself that I have a cheap yet authentic Lacoste. I want that much needed peace of mind. Hence, I went to Lacoste's Gateway Branch and wrecked my wallet to purchase a similar bag. I plan to use this on my birthday. :) Before enjoying the bag, I fulfilled my first objective. 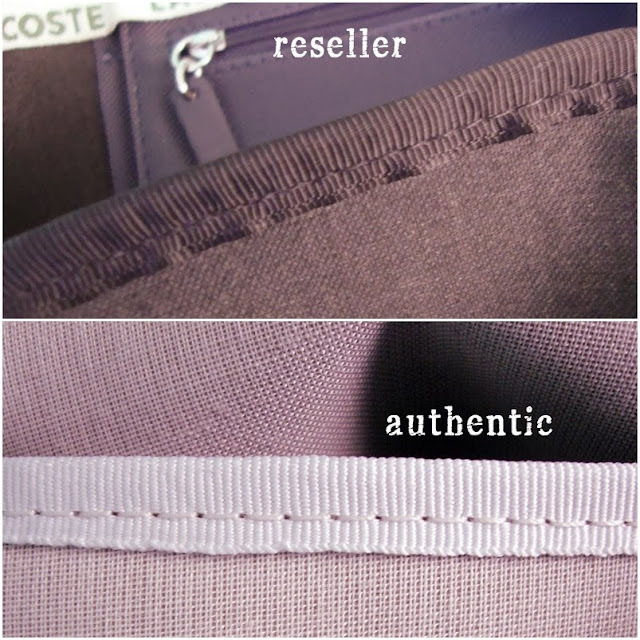 I have to verify whether the reseller version is identical with my authentic boutique version. I inspected the bags, took pictures and will be sharing my findings. Before reading the succeeding parts of this post, please remember that I intend to make a direct comparison of the reseller and the boutique versions. I'm not in the position to officially declare the authenticity of any Lacoste bag. My conclusion will be as good as what I observed from my bags. May I also emphasize the fact that I'm not comparing equally identical bags. It's possible that Lacoste intentionally created adjustments on the L.12.12 Concept Bags, depending on the size and color. 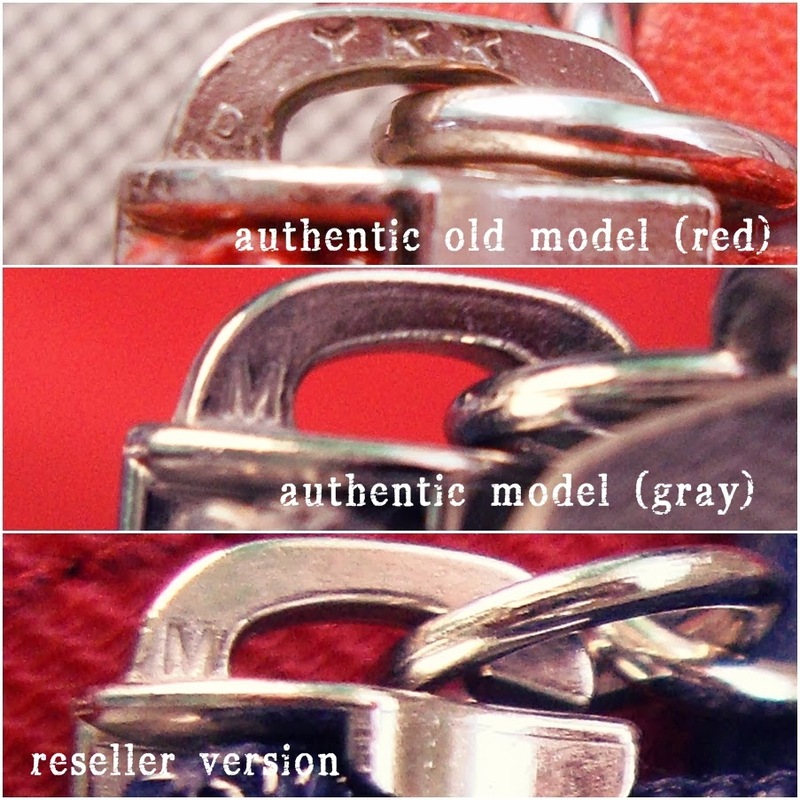 There is an obvious difference on the price tag of the authentic and reseller versions. Both brand name and logo are elegantly printed using embossed ink. I almost didn't notice the difference not until I took a photo of the two tags. Upon examination, the font used in the authentic version is larger but slimmer. Another evident difference is the printed price, stock number and model on the authentic version. The tag of the reseller version is left blank. Although the resellers might claim that they are directly sourcing their bags from other countries or directly from factories. Hence, the stock number details and prices are not printed. Each Lacoste Concept bag comes with a white printed ribbon that binds the bag when folded. The ribbon is embroidered with the brand name. The reseller sold the bag with the ribbon. I was almost convinced that there are no differences. The photos again unearthed another finding. As it appears, there is a slight variation on the width of the embroidered font. The embroidered font is wider and thicker in the case of the reseller version. The authentic version has a slimmer font and the stitching appears to be more clean and seamless. I also compared the straps of the three bags. The evident difference of the reseller version is the thicker strap. 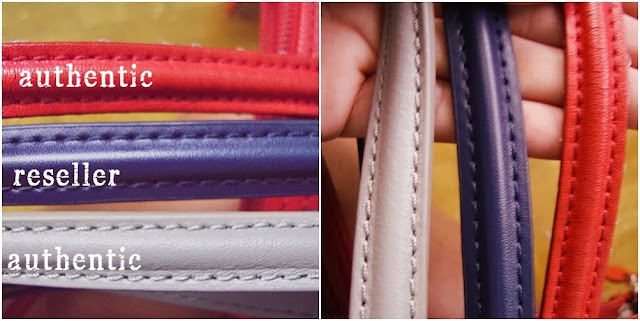 Another difference, which the picture cannot depict, is the feel of each strap. Both the red and gray bags have softer straps. The reseller version is stiff and hard to bend. I later discovered the reason why the straps of an authentic Lacoste are thinner and softer. The inner part of my deteriorating red authentic shopping bag is made of garter. I guess this explains why the thin straps remain sturdy. Hence, it's only the synthetic leather cover that becomes worn out over time. The garter material inside the strap also explains why the authentic version is easier to bend. The reseller version is thicker, harder and does not exhibit any form of stretches or flexibility. Aside from the elasticity, notice the differences in the stitches of the two straps. The authentic version has finer stitches ,which makes it more durable. The reseller version has larger and lousy stitches. The zipper of the reseller version does not reach the farthest edge of the bag. The authentic versions almost covered the edges. Although I have to say that Lacoste might intentionally created differences among the shopping bags based on the length of the straps. The earlier version of the bag used YKK zipper. This quite surprised me because the latest authentic model uses another brand, as shown on the carved M on the zipper's handle. The reseller version has the same carved M. However, notice the difference in the shape and size of the carved M. The M on the reseller version is wider and distorted. The handle of the zipper was another surprise for me. All zipper handles are engraved with the brand's name. The engrave of the reseller version is deeper and more evident. On the contrary, the authentic versions have lighter and shallow engraving. The inner edge of the bag, where the zipper is stitched, is covered by this repetitive embroidered Lacoste on white canvass. Please note that the earlier model of the shopping bag is printed in ink or paint. The latest version is already embroidered. 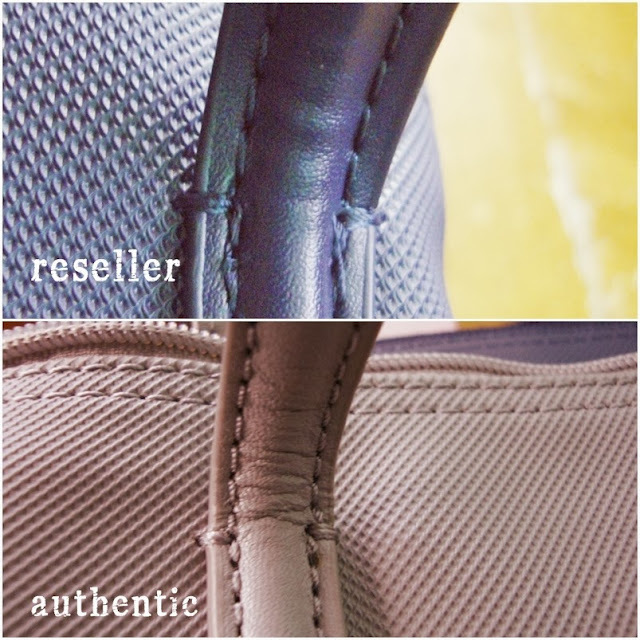 From afar, there seems to be no difference between the authentic vs. reseller version. A closer look tells that the authentic bag has smaller and wider Lacoste embroider. The reseller version's embroider is bigger but narrower. Also notice the seamless spread of the canvass of the authentic version. The reseller's version tends to crumple in the middle. These comparisons raised the level of my doubt to the authenticity of the reseller version. The position of the crocodile is obviously different. On the contrary, the earlier version of the bag shared the same position with the reseller version. Lacoste perhaps changed the specifications of the Concept bags over time. Each Lacoste Concept tote has an inner pocket where the model and logo are engraved. Both are found in the reseller and authentic versions. In the earlier version of the bag, please note that the inner pocket is free from any print. You can refer to the previous photo. Let your eyes relate the differences between the reseller and authentic version. The width and length of the font are different. The shape and size of the crocodile are not the same. This is another miss from the reseller version. The engrave was not straightly positioned. The authentic version's engrave was lighter but was stamped in a perfect horizontal position. The inner part of the bag gave me more regrets. As observed, there are screaming differences on the stitching of the lining that adjoins the bag's fabric. The lining and stitches in the reseller version were lousy and uneven. The authentic version proves to be the direct opposite. The lining was smoothly spread out with seamless stitches. The next photos validated my doubts on the reseller version. Before comparing the crocodiles of the two bags, I would like to reiterate that the red bag was released two years ago. There is a possibility that Lacoste intentionally changed the size and specifications of their embroidered logo. Also remember that the wear and tear of the red bag might caused some discoloration on the thread. Nevertheless, I'm writing some of my observations. How many differences can you spot? The screaming difference is the shade of the green thread. As it appears, the reseller version used a green thread that is two to three shades lighter. The shape of the crocodile's upper body is also different. The authentic version is more curved, while the reseller version is flatter. The quality of the stitches also caught my attention. The reseller version has poor stitching, evident on the lousy and crooked white thread that outlined the crocodile. This photo made me feel that I wasted my money to the reseller version. Consistent with my previous observation, there is a difference on the shade of the green thread used. The reseller version used a lighter thread colour. The upper body of the crocodile possesses more curvature on the latest authentic model. There are loose white threads on both logos. However, the reseller version is more evident and lousy. Lastly, I would like to seek your observation on the texture of the bag's fabric. Pictures may not suffice, but I have seen evident differences. The reseller version feels heavier. This can be explained by the thicker and rubber like material used. On the contrary, the texture of the authentic version feels lighter, thinner and smoother. I also noticed that the reseller version feels rough and becomes sticky days after using it. After making this long comparative post, here's my final take on the reseller version of the Lacoste Concept Shopping Bags. I'm personally convinced that they are fake. I will never buy from any of them again. I allowed myself to be cheated by the cheap reseller version. As much as I'd like to identify the name of the reseller of my navy blue bag, I prefer not to disclose. It's not because I wanted to protect the reseller. I wanted to give the reseller the benefit of the doubt. There's a possibility that the reseller is not aware of her counterfeited products. I also don't want to appear as a business antagonist. Hello everyone! Weeks after I made this post, I occasionally receive related emails. Over time, the number and frequency of emails seem to increase. Just this week, I have a feeling that someone too influential :) or have significant friends or followers in Facebook shared this post. Hence, the sudden upsurge of my blog's viewing statistics. Aside from the hits and clicks, I was flooded with emails of inquiry. My Inbox is erupting with emails with Lacoste as the subject. My fault because I left my email in the comments section. I'm not saying that the sudden bulk of emails gave me inconveniences. I actually appreciate everyone's trust and confidence. I suddenly turned as a Lacoste authenticator. Hahaha But seriously, I don't and will never claim to be one. As I have said, my comparison is good as what I observed from the two bags. The real reason why I made this post is because I want to answer the queries I often encounter. This update might save you from taking time to send me an email. I summarized the frequent questions and answered them accordingly. 1. Who is the reseller who gave me the fake Lacoste? I apologize for this personal choice. I believe that this post is enough to warn and save you from making a "fake" purchase.As mentioned in the original post, I don't like to cause any rift or conflict with anyone. I don't want to appear as a business antagonist. Someone even challenged the credibility of my post. If you have carefully read my post, I'M POSTING A PERSONAL EXPERIENCE. I'M NOT FORCING EVERYONE TO BELIEVE ME. It's just disheartening that this post suddenly turned out as a test of credibility and character. 2. Can I recommend a reseller? I'm sorry. I can't. This experience taught me a great lesson. I will never try resellers again. In addition to this, most resellers offer the bag from Php 1,500 to 2,000. Almost half of the prices in the official Lacoste stores. But you see, Php 1,500 is already a significant amount of money. If you can save Php 1,500 to 2,000, it will not be impossible for you to save funds to purchase an authentic Lacoste. 3. How does the inside tag appear? I hope this update answers your queries. If you have intentions of purchasing the Lacoste tote, please consider buying from the official Lacoste stores in the Philippines, authorized resellers such as Duty Free. How disappointing....I reached out to them but sadly, no response. I will leave it at this point. Thank you for this review! I recently purchased a Lacoste bag from a reseller but as I examined my bag, I'm confident that my reseller did not fail me (Thank God! I also bought my Longchamp Le Pliage from her which I also verified legit thru another blogger who made a review as thorough as yours). 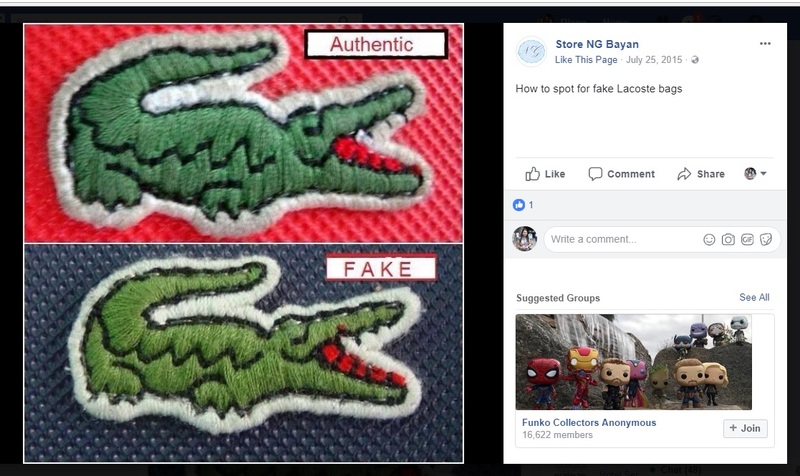 This is a very good blog for spotting fake lacoste bags. Ive been lurking on ig and fb for cheaper authentic coz I cant afford to buy one in lacoste outlets.. can u share the online seller where u bought yours?? hi may i know the online shop? Hi Ms. D, may i know your contact for authentic lacoste bag? Hi @Superkringdom! May I know the reseller where you both the authentic one? thanks! I just purchased 2 concept totes frm an online reseller I saw on FB. At first I thought baka legit naman kasi marami na customers. It was my first online transaction. And since i was always a lover of lacoste bags because of their durability and style, i decided to buy 2. Kasi nga din, the price was half of what stores offered. I got my orders today. And nung una pa lang bukas ko sa plastic, i smelled fake :( iba yung amoy. Iba din yun logo, madaming sobra na nylon thread. I felt really uneasy buong araw kasi feeling ko nga fake na bili ko :( when i saw ur blog, my doubts were confirmed. I felt really bad na for my first online transaction i was decieved. Lesson learned. Stick to the legit shops. May I know your reseller through email? Baka pareho lang sila.. we don't know. Thank you for sharing your experience. May i know also the reseller through email? i am also planning to buy a lacoste bag. Thankjs for the blog. Hi! May i know where the authentic ones are made? Some say their products are from china but are guaranteed authentic..
Hi Xtine! I actually forgot to check the tag inside the bag. Let me check if my authentic version is made from China. I'll try to update this post. Hi ms Diane pwedi kopo mkuha email ad nyo? Hi! May i know the online seller? Wat ur email ad diane? how about Lacoste metallic bag? I bought mine from Metrodeal. Hi Katrina! As far as I know, there are differences on the specifications of the metallic or limited edition vs. the regular concept shopping bags. Unfortunately, I don't have authentic and reseller versions. Hence, I can't really compare and tell. They have a few detailed photos of the bag. Hope this helps. Very informative, Diane! I suggest you inform the reseller of your findings baka nga kasi di nya alam na she's selling fakes. And in the event that she does, well, this blog post has already exposed her along with the others who aren't disclosing the non-authenicity of the bags they sell. Hi Rochelle! You can mention some parts of this post. I would appreciate if you will link me back though. Thanks. Hi Mclaren! Personally, I have a feeling that the reseller knows the real score behind the products they are selling. I believe I've done my share of protecting prospective consumers through this post. Thanks. hi Dianne, this review is so clear that proven my hunch of the authenticity of the one i purchased online. I informed them and offered to give a full refund. I won't buy any bags online again. Many Thanks! Hi pwde po malaman kung magkano yung bag na nabili niyo sa reseller? It's too late for me to read your blog. I already got mine for awhile now. Thanks for this information and full comparison. It made me realize not to buy on online sellers anymore. hi dianne! can I get the name of the online reseller? I was planning on buying a lacoste bag online, but i'm having doubts thanks to your informative post. Hi Diane, very helpful review. Nagplan pa naman akong bumili sa IG reseller. May I know yung name ng binilhan mo? Thanks! Hi Dianne! May I know your online reseller too? I bought mine online but it's the metallic edition. After reading your online, I inspected it and I came to conclude that mine is like half real and half fake. It's crazy bacause I know there's no such thing as that. Thanks much! Hi Diane and Rizelle! I think we have the same case. I bought this metallic bronze large horizontal tote bag L.12.12 from an IG seller and im confused if it's fake or not. I cannot really tell. Reseller told me it's from china (overrun). Please let me know. I can send u photos. 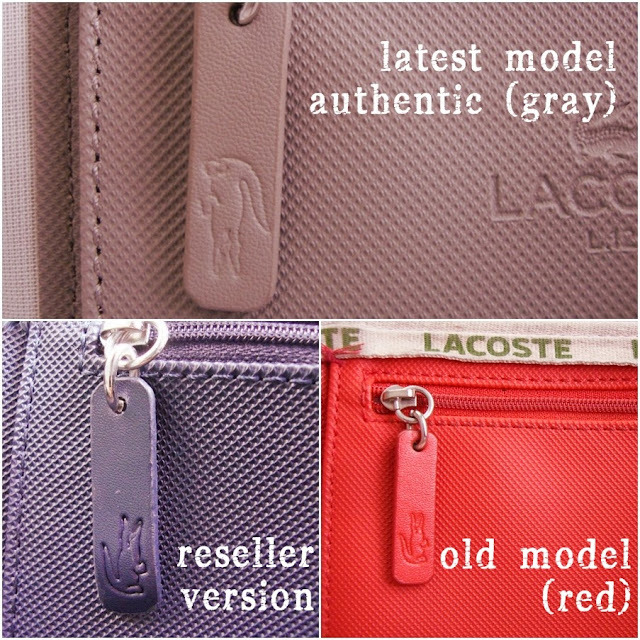 I dont have any idea with lacoste newer version of their bag, specially the mettalic ones. Look forward to ur reply. Hi Miss Diane, i just bought a Lacoste Shopping Tote Bag Purse Handbag Virtual Pink from a reseller, however im not sure if fake or authentic, can you please help me this. Thanks! hi diane! thank you so much for this very informative blog. if you dont mind is it ok if i ask the name of the seller? also where did you buy it from? my sisters & i bought 5 bags in ebay.ph and unfortunately, when we inspected the bags (according to your description), it's like 50% of it is "authentic" & 50% is not. thanks!!! Hi. Ano po name ng reseller? Hi Laix! I alreay replied through email. Hi Ms. Diane, can you recommend me an IG account, sll authentic lactose. hi may i know the name of the shop? kasi maraming ngbbenta super cheap lacoste bag na worth 2k-2800 lang specially sa instagram. Hi I just bought one from an online reseller and from your blog, I think I got an authentic lacoste limited edition gold shopping bag, though I cannot compare the logo with mine because it is with a gold thread. Any way, she boasted that she will gladly refund the money if we can prove that her lacoste bags are fake. I will bring my bag in one of the lacoste shop to check hahaha still in doubt because of the price - Php2,600. I also bought a gold metallic tote bag from online and im confused if its fake or not. Please let me know any differences with this "limited edition" bag. Appreciate your response on this. Great post Ms.Diane. I've been wanting to buy a Lacoste bag myself but I'm not sure if it's real or not... 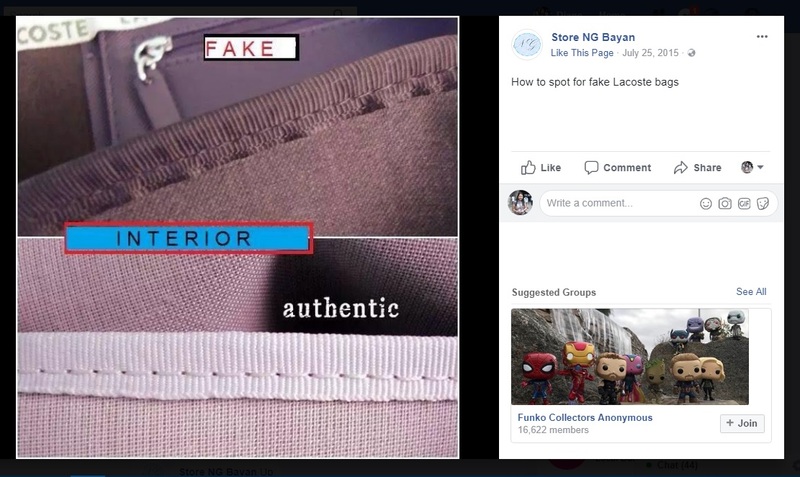 I'm always afraid being scammed so your post here is very useful... the logo is sometimes hard to recognize bec the replicas look exactly the same with the original one. I'll refer back to your post soon. Thanks! Thanx for this very useful article Diane! May I know the name of your reseller? m.caler@yahoo.com thanx! Unfortunately, I already disposed my reseller version when I took photos of the inside tag. Thanks for posting this Ms.Diane. I am planning to buy one pa naman from a reseller. Thanks. This is very informative. My first time sana to buy from reseller pero nag-think twice talaga ako. Buti na lang! hi superkringdom can u send me whos your online seller .. thanks ..
WOW- this article is superb!!!! From another writer I really like the way you presented this point by point comparison article- excellent job. Going back to the topic there are so many re-sellers sprouting online mostly on FB and instagram. Actually a good friend of mine is offering her Lacoste Bags and other stuff and she is insisting that they are authentic. I am genuinely concern and even argued a bit since I've written and researched about Lacoste products. To make it short she just reasoned out to me- "oh well my photos are not that good that is why the bag looks fake.."and so on. 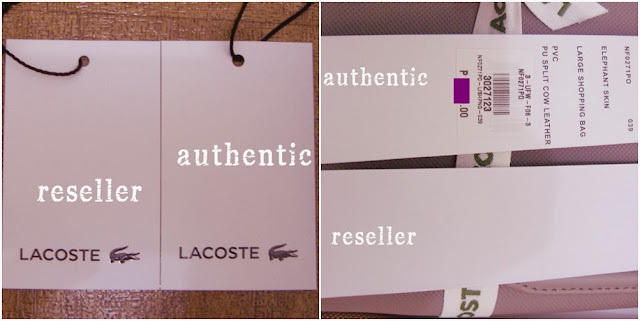 Anyway, I love genuine articles and would not be caught wearing a fake, more so the very common favorite faked Lacoste bags that you'll see in many shops around Divisoria and Greenhills so I just buy or request genuine items from brands that are not too common here from close friends abroad or directly shop online at the product's official website. Thank you so much for this article and for sharing your experience. This is truly valuable to many shoppers. Kudos!! Hi Michelle! Thank you for the comment and understanding my sentiments. I really appreciate it! At the end of the day, I always tell everyone that it's best to buy items from the official stores. Thanks for the info about Cash Cash Pinoy as well. Very well done. Excellent article! From another writer I truly appreciate the big effort and quality of this comparative work- very good. truly valuable for a shopper like me. 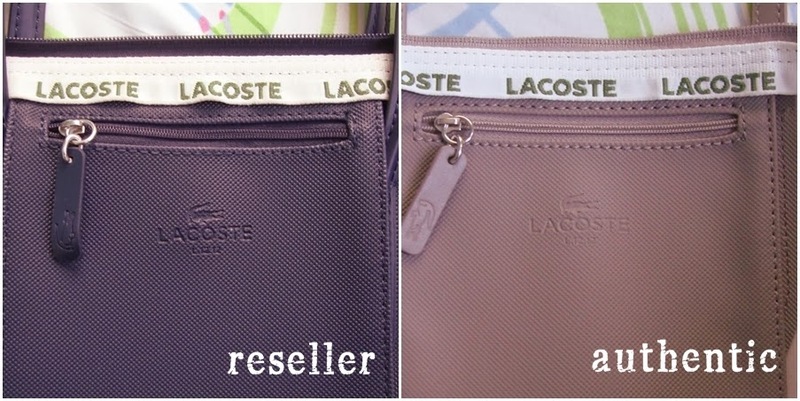 Actually, I've been arguing a bit with a good friend of mine who is offering me to sell her Lacoste bags posted on FB. One look I could tell that it is fake so I casually and politely ask her what's the bag model/name and where did she gets her stuff- she just told me someone form Lacoste shop here told her that her bags for sale are authentic...now I am wondering probably the shop assistant don't ever care or a friend of her supplier. Anyway, I chanced upon your article in search of proving to my friend that her items are fake. And let me just share to you that the website CashCashPinoy sells fake products- I was a victim last year..too bad. Thank you again for sharing your experience and would like to tell you this article is very valuable. Congrats! Hi Ms. Diane. I recently bought a Lacoste bag but haven't paid for it yet. can I show you the pictures thru email? Thanks in advance! Hi! ms Diane. thanks for sharing this to us..
so aun, ask ko lng if matagal po ba namn bago masira or maputol un handle? years b sya magagamit? purpose ko lng kase s tote bag is pag may occasions at need ko dalahin SLR & ipad, s malaking bag ko ilalagay at hindi s SLR bag para isang bitbit lng ako. on ur own experience, hindi b sya advisable talaga n lagyan ng mabibigat? please i need ur help. coz iam planing to buy lacoste tote bag dis 2nd wk of march.. In my case, it took 3 years before the handles gave up. Actually, the handles didn't really get detached from the bag. As you can see in the photos, the handle of the authentic version is made from garter. Kaya, hindi siya talaga mapuputol. The part of the strap that got worn out is the synthetic leather cover. i bought a lacoste bag at lacoste store in duty free and the color of the bag inside is black?is it authentic? i just bought a L.12.12 bag at a lacoste store in duty free and the color of the inside of the bag is black..is it authentic?thanks for for your reply..
Hi Diane, I'm so lucky to se your blog! I really want to buy a Lacoste tote bag and wrislet since last month as a birthday gift for myself and keep asking for an authentic one, I even asked my friends how I will know if it's authentic since I am an online buyer because it's more comfortable with me because I am a full time mom. Your blog is a BIG Help! a very detailed informations that will help a lot of people. By the way may I know the FB and ebay reseller that are selling fakes? since I am an online buyer so I can check, may I know also how will I know if the wrislet is authentic? Pls email me at dhimphy@yahoo.com thank you so much! Hoping to hear from u soon, God bless! I bought my bag from a friend last December. Is it normal na un cover sa gilid ng handle ay natatanggal at yun zipper handle ay bumuka? In my case for the authentic version, the handles are still in good condition. Same as with my old version red tote. It was only the straps that become worn out over time. hmm im thinkin tuloy if I found out that what I am selling is fake I'll stop bein a reseller of this bag. 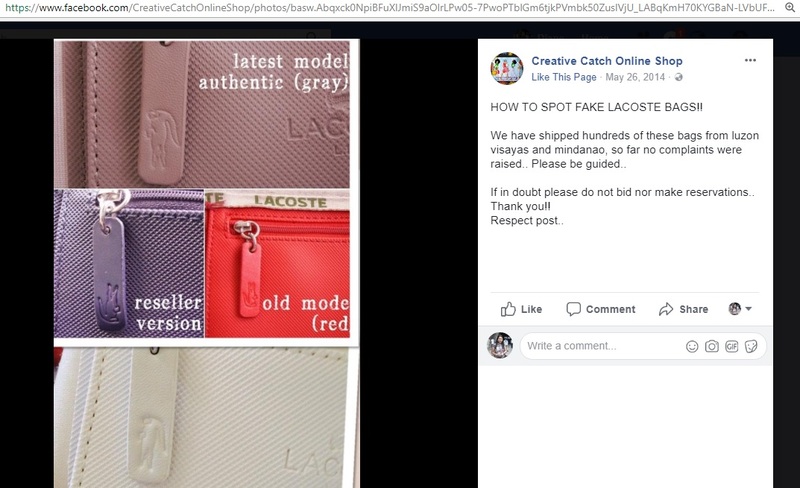 wow thanks for this post, I am a reseller of Lacoste bags and isa sa mga binebenta ko yan nasa article mo. I have two orders tonight actually. Noted those differences on this blog and ill try to figure out if what i am selling is fake or not. Trusted ko kasi ung Tao na kinukuhanan ko ng bag kasi she's my aunt and a very respectable instructor sa isang kilalang University so Im not doubting her to sell some fake items. Hope I'm selling the right one. Tomorrow or the day after Pick-up ko ng bags sakanya and from that i Checheck ko un mga pointers mo dito.. Thanks ! Hi Diane! may I know the reseller who sold those not really authentic lacoste bags? I'm planning to purchase from e-Bay but got hesitant after reading this post. Thanks! I hope you could also post here the difference between authentic and fake for the limited edition (e.g. metallic gold). Thank you! Hi Rubyros! I don't have an authentic Lacoste tote in metallic or limited edition. Hence, I can't really compare and tell. Thanks. Bought a lacoste bag just now.. does the reseller version have a tag inside? Thank u! Hi Chryseis. I already disposed my fake reseller version. Hence, I can't tell. Please refer to the authentic version posted. Thanks. I like your review. In my case gustong gusto ko din ng lacoste bag. My first lacoste bag is L.12.12 small na red. Just purchased it last January sa Lacoste boutique sa Glorietta kaya im sure its authentic. Sa pag tutok ko sa pictures ng Lacoste bag mo same sila ni authentic gray mo. After a month ng pag purchase ko, may pwesto din ng lacoste authentic din daw sa mall here in Alabang. I think yung girl na kausap ko sya mismo may ari nung booth, she told me to compare my bag with the bags that they are selling. Kahit anung sabihin nya na authentic yung bag nya hindi nya ko na akit na pansinin yung bag nya. Hahaha! Authentic? Tapos na ka patong lang sa tables, she's offering it for 1,500 or 2,000 something like that. 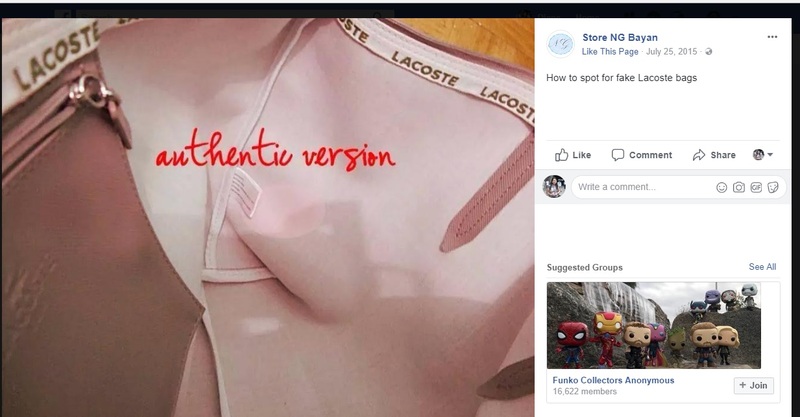 Ang palusot nya, direct daw sila na kakabili ng Lacoste Authentic bag sa china, bumibili daw sila in bulk orders, then ship to Manila and voila ayun na selling it nga for cheaper. Sabi ko nga, ganun lang pala yun pwede mamili ng bulk sa china ship it here in Manila then you can sell it na ng mas mura. I asked her if they have a permit to sell authentic bags from lacoste company, ang layo ng sagot nya. Nag babayad nman daw sila ng tax thru shipment. Ahahaha! Natawa ako sa kwento mo :) Yes the bags are made in China... but I don't think you can directly buy from the factory (feeling ko lang naman). Though its made in China, I think the bags reach their main selling points in Europe or France first. Thank God di ko pa na try bumili thru online or any one na reseller. Yes its cheaper. Pero lagi ko kasing sinasabi di baleng di ko ma bili yung authentic. Ang importante di ako bumili ng fake. Parang trying hard kasi, masabi lang na branded kahit fake??? hahaha! Di nlang. And im sure kapag fake ang gamit mo, di ka din confident sa sarili mo. Yan nag no. 1 kalaban mo kapag fake dala mo, Confidence. Thank you for your time doing this. hi pasend naman po ng name ng reseller sa email add ko reyesshenalei@gmail.com. Im planning to buy din kz ng lacoste bag sa online seller sa fb my sinend xa sakin mga pictures nung bag i will send it to your email add para macheck mo din kung authentic nga before ko bilin.. thank you. Hi Cha! Please be the first one to send me an email. Although if you would check back the updated post. I partially answered your query already. Thanks. Hi Diane! What's the name of your reseller? Definitely think i bought a fake one. So sad :( Here's my email jaspaguia@gmail.com Thanks! Hi Jasmin! Please be the first one to send me an email. Although if you would check back the updated post, I partially answered your query already. Hi Princess! I already answered your query in the update post. Thanks. Thanks so much for the informative blog you did about Lacoste bag. I have been a Lacoste bag fan for more than 2 decades now. Buying my bags at the airport duty free shops or outside the country. Up to now my bags are still in good condition and my daughter is one using it already. I am planning to buy this Lacoste shopping now almost gonna hit the button buy when I accidentally saw your blog. Now I have doubts whether to get it from the reseller I saw on FB or not, Would you mine sending me email at timentide2004@yahoo.com regarding the reseller that you are mentioning here. Many thanks. Hi Ms.diane, pwede po ba mahingi yung name and fb page ng reseller. I just bought lacoste bag from reseller and nung nabasa ko to, hndi ko parin ma figure out kung fake ba or authentic yung nabili ko. Thank you! As mentioned in the post, I don't have intentions of identifying the name of the reseller. I don't want my blog to cause any rift or conflict with any of them. Hope you understand. What I offer to other readers who email, I request them to send the name of their respective reseller. Should I not reply, you can take it as a sign that you landed on the same reseller who gave me the fake tote. I hope I got your query right. When I visited the Lacoste store last year, I never found a Lacoste elephant gray in long handles. For the lilac, I'm not sure if they both have long and short handles. Hi Criss! I agree with the smell. The reseller version smells "rubbery" it was way different from the Lacoste I purchased from the authorised shop. If you are in doubt, you might want to return the bag to the reseller and ask for a refund. Hello diane... i recently bought a lacoste bag online. After 3 days of using it, i noticed na nag fefade ang color in some areas of the bag. I asked the seller if the bag is really an original, orig naman rw. But i have my doubts. May i know your opinion regarding this so i could return it to the reseller..big thanks. Can you share with me the reseller where you bought your fake tote? i already answered your question in the post. thanks! Hi Diane, thank you so much for your precise comparison. Now I know. Can you share the reseller's name where you bought the fake tote? Thank you. Hi! Pakisend naman po sa email ko yung seller. jachemcapio (at) gmail.com. Thank you!